I've been to art capitals of the world such as Paris, London, Amsterdam and Vienna and have ventured into extreme sports in New Zealand. But one thing on my bucket list was to see the Northern Lights or the Aurora Borealis as it is scientifically known. The Northern Lights are a natural phenomenon and it is not easy to see them. 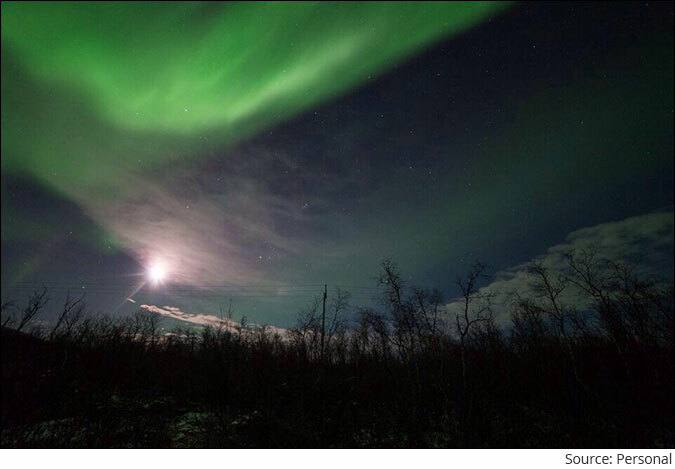 First, these Lights can only be seen above the Arctic Circle or near it. That means only a handful of countries make the cut. They can be seen only at night between September and March. Because it's a natural phenomenon, there are various weather-related factors that need to work in your favour. There is every possibility that even if you travel to the North, you may not see them. Now, armed with all this knowledge, my husband and I approached a local tour company. They had excellent reviews on the website. After all, locals always know the lay of their land. First, they could never give any guarantee that we would see the Northern Lights. However, they assured us they could guarantee they would do whatever it took to increase the chances of seeing the Lights. So, if we could not see them in Tromso (the Norwegian town where we were based in), they would drive us all the way down to the Finnish border, a 2-hour drive. In other words, wherever the reports told them the skies were clear, they would take us there. Second, they told us to book not for one night but 2-3 nights. The rationale - it is not necessary that you see the Lights on Day 1, Day 2, Day 3 (if you can that's an extra bonus). Even if you see the Lights on one of the three nights, it would be a highly successful trip. We booked for 2 nights. We were unlucky and did not see the Lights on the first night we ventured out. However, on the second night, despite a shaky start, the company drove us all the way to Finnish border, and we got to see a spectacular display. If you have the right approach or the right system, the results can be spectacular. This certainly applies to investing. If you have the right system and process, I believe you can make great gains in a short time frame of 12 months as well. Specifically, I'm talking about potentially making 100%+ returns in about 12 months. You don't have to necessarily be a long-term investor. That is why I developed my new and exciting system - Power Profits - to pick such stocks. The companies that fit into my Power Profits system have 5 points in common. Using my Power Profits system, I identified 3 extremely lucrative growth stocks you could consider buying right away! Equitymaster requests your view! Post a comment on "How the Northern Lights Helped Me Pick 3 Stocks that Could Double in the Next 12 Months". Click here! 2 Responses to "How the Northern Lights Helped Me Pick 3 Stocks that Could Double in the Next 12 Months"